Editor’s note: original post was split into two parts; part II will get published on Monday. I was catching up with an old college-buddy of mine, Brad1, recently and we started swapping work stories. Since he’s a software engineer, we (predictably) stumbled onto the topic of build engineering. He was frustrated at work: the build tools weren’t what he would’ve chosen, builds took too long to build (and rebuild), adding new modules was a pain, and his build team seemed content to ignore the problems. He struggled to understand why the build engineers weren’t more helpful: “We spend the entire project lifetime working on the build tree, whereas the product ships just once, at the end,” he reasoned. While I was slightly miffed by the sentiment, it’s nothing I hadn’t heard before. And, in the strictest interpretation, he was, of course, right. But I thought about it some more and I realized we were both right. And we were both wrong. Every environment I’ve worked in has entailed a mix of “developer support” and “build infrastructure construction/maintenance.” I took a hard line position to make a point3, but Brad’s expectations of the build team weren’t right either: it’s always been a continuum4,5. Apologies in advance to the absolutely wonderful Indexed. Note that the Shipping Software band takes up the middle of the X-axis, but as more is invested in build infrastructure, this band will actually shrink. The Build Guru‘s6 sole responsibility is to monitor continuous integration, work with developers to fix failures, and generally provide interrupt-driven services for developer/program managers. Usually seen in bigger teams, with big budgets. Crank Builders and Turners work on the “crank” that releases your software; some environments find it useful to make this distinction; the separation’s success largely depends on management and personalities involved, I’ve found. The area of the spectrum marked by poor decisions is where the build team has such little influence and the environment is so developer-driven that the act of shipping the bits is negatively impacted7. Someone who turns out to be a surprisingly good Source of Great Specs is engaged in developer support, but has the ability to influence those processes, which often gives the role on the other side of the graph a lot of help in the requirements for a build infrastructure that can directly and positively impact developer productivity. The “Possible Warning Zone” exists in any environment where the build team has maximal influence, but is disconnected from the developer-support function. It’s not a given: a build team focusing on requirements solicitation from the engineering organization can help provide an almost-utopian environment for developers; if they team doesn’t, it’s painful. The good news: I have never seen a build team in this position. The “Bad Process Feeding Zone” marks conditions where, given the correct circumstances, poor process flourishes, either by creation of new, bad process, or the stagnation of old, bad process. Build Engineer Burnout Central marks the zone where the organization will just burn through people left and right: mindless turning of the ineffective crank, with a focus on nothing put pushing software out the door. Good engineers will get bored and leave. Poor engineers will get stressed out. And leave. 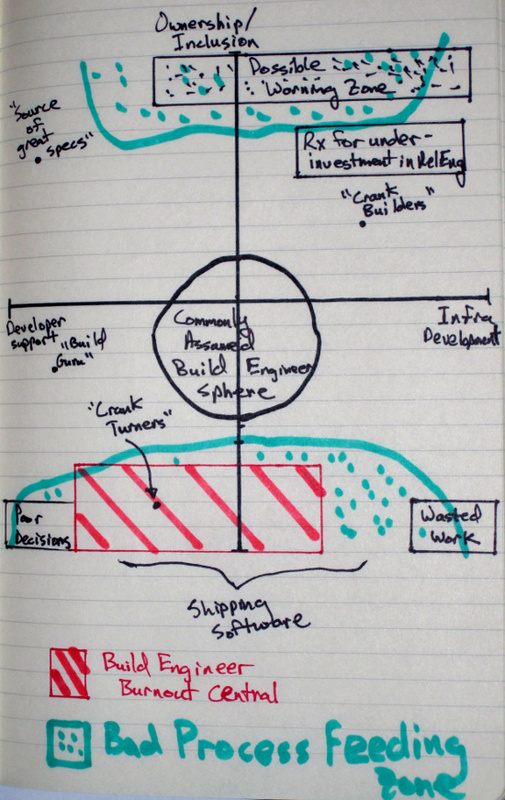 So we have a nice graph to describe where build engineers focus their time and effort, and now we can discuss where they are, where they might move to support the organizational needs and what issues that may result as that all happens. I’ll talk more about this X-axis, and why Brad and I were both simultaneously right and wrong on Monday. Very nice chart, exposing some of the most difficult to explain, but painfully important, aspects of any release engineering organization. You know I’m going to steal this, right? If I end up doing that, I’ll send ya a copy!